In which I slam my fingers badly in A Little Knowledge. Er... no. No no no. To an armed forces charity. That's probably an important difference. I mean, it's not that I'm such a hopeless leftie I don't think we should have an armed forces, or even that they should be adequately funded, but I do think maybe buying a symbolic representation of a Flanders Fields poppy to help get the Royal Tank Regiment a new Challenger 2 might be ever so slightly missing the point. Those don't sound to me like the words of a man who'd be unhappy if we all chipped in for a tank. Lazy comedy cliche things that actually happened to me this weekend. I was infuriated by the confusing instructions for assembling some flat-pack furniture. I avoided work by needlessly alphabetising my DVDs. I hit my thumb with a hammer. Join me next week, by when I will have slipped on a banana skin, had my computer explained to me by a child, and enthusiastically slagged someone off before realising that she's standing right behind me, isn't she? First five things I thought on looking at this portrait in the National Gallery, which basically mean I don't deserve to go there. * Wow. That horse has a really tiny head. * Charles I and his horse have the same hair. * If everyone had a small framed sign saying who they were hung up beside them wherever they went, would that be useful or irritating? It would certainly be good at parties. * Did Charles pick the horse because it had his hair, or did he get the horse first, and then grow his hair out in order to copy his horse's signature look? Or hasn't he even noticed? I bet the rest of the court has. Van Dyke definitely has. go round the other way." BEECHAM'S PILLS are just the thing! Two for an adult, one for a child. Will restore him without fail! Where FIRST RATE PIES are sold! A HOUSMAN'S STEAK AND KIDNEY PIE! With reasons for your choice. Which means 'Growing' is still my best effort. Any advance? So, it turns out you can have a whiter shade of pale, and grass that is greener on the other side. You can have redder blood than I; tell bluer jokes, and have a blacker heart. Your face can be pinker; browner; yellower; greyer or even purpler than mine. But... there's no such word as 'oranger'. What crazy system is this? How am I meant to compare two things, both of which largely reflect light at a wavelength between 585 to 620 nm, but one noticeably more so than the other? How am I supposed to differentiate between half-hearted and fervent supporters of the Dutch royal family? What sort of a impoverished tongue is it in which we cannot point out that both these oranges are orange, but this orange is the oranger orange? It's an outrage. Talking of London Zoo, this is the life-size statue that stands right in the centre of it, between the flamingo lake and the tiger enclosure. Yep. Striking, isn't it? In case you can't read the plaque, it records that the sculpture was presented to the zoo by J. B. Wolff in 1906. I see. So, in 1906, J. 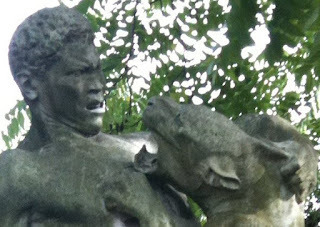 B. Wolff commissioned an enormous sculpture representing man and beast locked in their age-old conflict; the lion straining to rend the man apart with tooth and claw; the man armed with a primitive knife, desperately trying to disembowel the lion - implacable enemies locked in a fight for survival only one of them can win. And then he gave it to a zoo. You know what I think? I think J.B. Wolff simultaneously gave the zoo a large amount of money, on condition that they prominently display this statue in perpetuity. I think J.B.Wolff hated the zoo. You're a funny guy, J.B. Wolff.